There are more opportunities than ever before for young people with disabilities to participate in sport and adapted physical education. For example, there are more than 3.7 million athletes worldwide aligned to the Special Olympics organisation, with national associations active in more than 200 countries worldwide. Despite this rapid growth, all too often coaches and teachers lack adequate knowledge of the particular challenges faced by people with intellectual disabilities. The principal aim of this book is to improve the understanding and professional skills of coaches, teachers, practitioners and researchers, to promote awareness of successful programmes addressing the needs of such young people, and to challenge the prevailing myths and stereotypes surrounding their abilities. With contributions from leading researchers and practitioners around the world, this book is the first to explore in depth the topic of sport and intellectual disability from a coaching perspective. 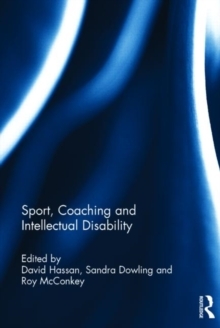 Including both theoretical discussion and empirical case-studies, the book covers a full range of contemporary issues and themes, including training and coaching, family support, perceptions of disability, athlete motivation, positive sport experiences, motor development programmes, and social and cultural aspects of disability. Sport Coaching and Intellectual Disability is important reading for any student, researcher, coach, teacher, manager or policy maker with an interest in disability sport, physical education, coaching, or mainstream disability studies.